Are you searching for a company in Navarre, Florida, that installs entry doors? If so, look no further than Majors Home Improvement. We’re a company that is so dedicated to our customers and to providing an excellent experience that we’ve developed an entire system to ensure that every customer we serve is given individualized, courteous treatment. This system, called Red Carpet Service, includes providing clear communication throughout the project, taking off shoes when in the home, being respectful, and being mindful of plants and pets when working. It’s because of this commitment to our customers that we have earned an A+ rating with the Better Business Bureau and a five-star rating with GuildQuality. At Majors Home Improvement, our Majors Select™ Fiberglass Entry Doors are composed of a polyurethane core, so they provide much better energy efficiency than wood doors. They resemble gorgeous woodgrain textures, like oak or mahogany, and are virtually maintenance free, resisting rotting, denting, splintering, and rusting. You can count on receiving an entry door that will boost the curb appeal of your home and have impressive longevity. We’ve served in the Panhandle region since 1997, so we’re not a fly-by-night operation, but have a long-standing reputation in the area. Our installation teams are factory trained and highly experienced, skillfully and efficiently installing entry doors for our customers. We offer financing for our customers, making this home investment more affordable than ever before. 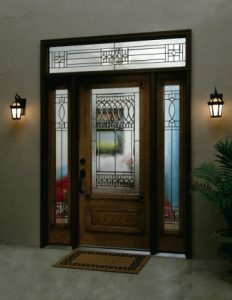 For further information about our entry doors, contact Majors Home Improvement today. We’re pleased to serve homeowners in Navarre, FL, and the surrounding area.